The General Students' Committee (AStA, short for ‘Allgemeiner Studierendenausschuss’ in German) is the university-wide student representative body. The committee represents student interests before the university, society and politics, and its members are elected by the student government. The AStA is also a member in many national institutions and organizations. 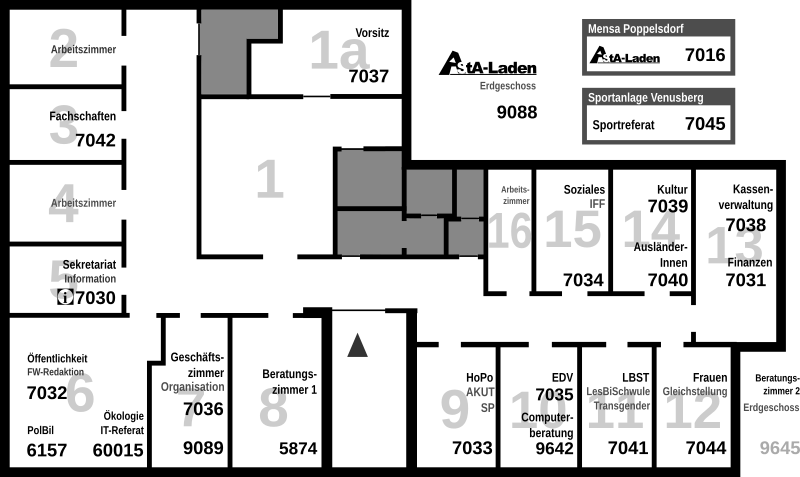 The following map shows the floor plan of the AStA offices. The 4 or 5-digit numbers are the phone extensions of the respective departments: 0228-73-XXXX. The presidency is responsible for the work of the AStA. The president and vice-president coordinate the focus of all 13 individual AStA departments and how they work together, and externally represent the student body of the University of Bonn, meaning before the university and the student union, the municipality and the country, as well as in the press. In order to be able to successfully advocate for student interests within the university, the AStA presidency sits in the university’s senate (the highest internal decision-making body) in an advisory capacity. The AStA presidents meet regularly with the university’s president, the director of the student union and other important decision makers, in order to keep up-to-date and informed about developments at the university and to see them from the perspective of the student body. They respond to external enquiries, organize a weekly meeting of the staff and representatives of each AStA department, and give an account of the AStA’s work to the student-elected student government. As presidents, we stand for a General Students’ Committee with a strong political voice. We not only want to offer services, but also want to help shape the climate and conditions of the university and improve them wherever possible. We stand up for your interests – firmly, honestly and responsibly – even when it can be disagreeable. Problems such as the rigid primary/secondary school-like system during the first years of bachelor and masters programs of study, the low percentage of female professors (11%! ), the existence of a high governing body (the university board of governors) with little democratic credibility, the elimination of smaller programs of study, and much more, must be addressed and remedied where possible. We work together with you to find solutions that can subsist beyond the University of Bonn, in the context of reflecting society as a whole. You are always welcome to actively contribute, to make us aware of your grievances, and to give suggestions to help shape and improve the university. The office handles print jobs, organizes flyer distribution and postering, takes care of technical and organizational questions, supplies IT equipment for events, purchases furniture, equipment and tools etc., arranges repairs, oversees the photocopier, and is the service point for anything else that no one else is responsible for. The AStA distributes flyers and posters for the academic departments and student groups registered with the AStA, as long as it has the capacity to. Appointments can be made by telephone. Flyers must be submitted by 16:30 one business day before the arranged distribution time. The posting of posters always begins on Tuesday mornings. The posters must be submitted by 12:00 on the Monday before the arranged posting time. The earlier the flyers or posters are submitted, the greater the chance that they are distributed on time. As long as it is not needed by the committee, the AStA also lends out its equipment to the academic departments and student groups registered with the AStA. The following equipment is available: Video projector, overhead projector, screens etc. The earlier you request it, the greater the chance that your desired equipment is still available. We gladly accept housing listings by phone, mail, fax or e-mail. The offers will be posted on the notice board ‘Schaukästen’ in the AStA hallway and can be browsed on the AStA homepage. We do not provide housing assistance by telephone. We are available by telephone for questions about the AStA departments, opening hours and general inquiries. We strive to promote tolerance and inter cultural exchange. Therefore, we support projects which promote positive integration at the University of Bonn with the help of the International Office, ESG, KHG and other institutions, organizations and students initiatives. These organizations help us strengthen inter cultural dialogue. Also we provide information and advice for international students at the University of Bonn and guide students through all aspects of study, work, visa and employment processes and give information about job and housing search. Our multilingual team consists of international students who experienced similar problems at the beginning of their stay in Germany like many affected people. We offer assistance in addressing social, cultural and political problems. Our staff speak German, English, Spanish, Persian, Serbian, Macedonian, Bulgarian, French, Singhalese, Hindi and Bengali. In addition to consulting services, we offer the language partner program (Tandem) to provide the opportunity to learn languages from native speakers. Furthermore we offer a language Café (Sprachcafe International) every Monday, where students can improve languages. For more information on our events please check our facebook page: https://www.facebook.com/bonninternationalstudents . We are in charge of coordinating the student councils of each faculty, in order to make their work more effective. We support them by holding elections, parties etc., coordinating the welcome events and making sure that each student council receives its allocated student fees. In order for this coordination to run smoothly, weekly conferences with the student representatives of each faculty are held (Mondays at 19:07 in the Fritz Tillmann Room). Unfortunately, not all of the faculties are present each week, so we issue meeting minutes (called the ‘Fachschafts-Informations-Dienst’ – Student Council Information Service) to each student council. This way, we ensure that each faculty receives the latest updates and can take them into consideration in their work. Further, we offer topic-specific meetings in order to address current problems and activities. Besides coordination, we also see to administrative tasks such as the allocation of student funds, the changing of regulations, etc. Furthermore, our department acts as an intermediary between the AStA and the faculty student councils, so that each group knows what the other is up to. Our office in the AStA (room 4) is open daily (Mon. –Fri.) during the semester. We are here to answer questions and are available to the faculty student councils that were unable to attend the conferences. We are a self-governing department and therefore independent from political decisions made by the AStA. We are selected by the student council assembly. The AStA and the student government take the decisions of the faculty student council conferences seriously, even if they are not necessarily bound to them. The Fachschaft is comprised of all students of one field of study and is how the student body as a whole is subdivided. Once per year, each faculty elects its student council. The election date differs between faculties so that the students can focus their attention on one election at a time and the campaign materials do not compete with each other. Unfortunately, the voter turnout for these elections is quite low, because many of the students don’t know why or for what they are voting. So we ask you to inform yourselves so that this doesn’t happen to you! In some cases, plenary meetings take place for important issues so that decisions are not made by the elected representatives alone. In the larger faculties (more than 500 students), the Fachschaftsvertretung is the representative body which is directly elected by its respective student body. In turn, the number of elected members depends on the number of students in that faculty (max. 19 representatives). The Fachschaftsvertretung votes on the budget, selects the electoral committee and, most notably, the Fachschaftsrat. The Fachschaftsrat is a similar student council-like body to the Fachschaftsvertretung. In the faculties that are smaller than 500 students, the Fachschaftsrat takes over the tasks of the Fachschaftsvertretung. It must also undertake all the regular tasks of a Fachschaftsrat as well: this includes daily services (e.g. the sale of lecture notes, the loan of exam outlines) but also larger tasks such as first-year student services, organizing events and parties, providing information about current events at the university etc. Elected members, as well as any interested students, can take part in this work. This way, you can take on student council duties without all of the responsibilities. So look into it! Welcome to the finance department and treasury page. Together, we take care of the financial administration of the University of Bonn’s student body. Besides the AStA’s finances, this also includes the administration of aid funds for the self-governing athletics department, the collective and special student council funds, as well as the NRW-Ticket. The treasury’s main function is to carry out payment transactions and to manage the accounts, while the finance department is mainly responsible for money transfers and control matters. * Alongside these tasks, the finance department must draw up a student body budget as well as monitor the adherence to this budget. Our fiscal year runs from the 1st of July to the 30th of June. In the downloads section you will find the up-to-date budget, as well as the dictates that we comply with. What does my 292.16€ go towards? The department for university policy protects your interests against the university and the state government. We address all topics that are important to students at the university and state-wide levels. The introduction of the bachelor/master format caused a large upheaval at the university. We have met the goals of the Bologna Process, which aims to create a unified European post-secondary system (The European Higher Education Area). However, there is still a great need for improvement in the implementation of the process: the new degree formats are too ‘school-like’ and inflexible due to their modularization. More options should be available. The bachelor and masters modules definitely need to be more structured; therefore the university must provide more assistance by hiring more guidance counselors and offering more tutorials. But even though a main goal of the bachelor degree modules is to provide skills for job qualification, academic quality should not be neglected. Last of all, credits earned abroad or at another German university must be recognized. Students should not have to fall behind by a semester just because they change post-secondary institutions, and the Bologna Reform should make it easier to complete a semester abroad, not make it more complicated. Those with bachelor’s degrees should have a right to a spot in a master’s program. Students who are currently still enrolled in an outgoing diploma or magister program would be wise to complete their studies as they stand. The main problems that arise with this are expiring exam deadlines or a lack of courses on offer. However, diploma and magister students should not be put at a disadvantage. We follow the principles of a democratic and multifaceted university. We aim to strengthen the voice of the students on all levels, and therefore call for the abolition of a university council that comes to important decisions, such as the election of the university president or the resolution of the university development plan, without student participation. We want a diverse university, where even small programs of study have a home. It is necessary to prevent job cuts as well as to prevent the university from focusing only on the ‘profitable’ faculties. For up-to-date university policy developments, check out this website, read the ‘fw’, or attend our regular events. We are always here to answer any questions or address any problems you may have. Both students and staff at the AStA rely on a dependable IT infrastructure. We try to reach this goal through our work in the IT department. When it comes to new computers, software installation, the website, etc., we are the go-to people in the AStA. We also act as a link between the departments, the chair and administrators. On the one hand, we try to implement staff requests, and on the other, we try to incorporate our knowledge on technical matters as well as matters that are often politically underrepresented, for example those concerning data protection and transparency. We represent student interests, not only in the AStA but also in the IT forum, which covers the university-wide IT infrastructure. Here we can influence systems such as Basis and E-Campus, the WLANs, and the outfitting of computers in the faculties and libraries. In order to be able to act on your behalf, we need your input. Can you never find a free computer? Has Basis forgotten your registration in a seminar or displayed incorrect exam results? Do you often find yourself in a WLAN dead zone? And if yes, where? Come by our office hours, e-mail us, or call us, so that we can tackle these problems where they arise. You can always visit us, our website or our events to inform yourselves on IT topics and to stay in the loop about recent developments. Student engagement at the University of Bonn is an integral feature of a vibrant campus environment. There are almost 80 student groups covering a wide range of topics, from political to cultural to intercultural, offering many diverse opportunities for student involvement. In order to foster student engagement, the AStA’s cultural department offers consultation for the established student initiatives and supports students who are interested in founding new student groups. They mostly help with organizational and logistical matters. Besides individual consultation during office hours, the cultural department also makes information materials and pamphlets available on the AStA’s website. The cultural department helps with the matter of financing the activities of the cultural groups and student initiatives. A yearly financing budget is made available to the Department of Culture and Student Initiatives regarding the cultural groups and student initiatives. However, the AStA does not take on full financing of the projects, rather it awards subsidies. At the beginning of every semester, the AStA cultural department hosts the ‘Kulturplenum’ (cultural assembly). At this event, the registered cultural groups present their planned events and financing applications for the upcoming semester. Each group’s proposal is collectively discussed and then voted upon. Student initiatives can also apply for financial support from the student government. Contrary to the cultural groups, they have to send their application directly to the student government and present their proposal in front of the assembly. Here, the cultural department also gives counsel regarding the relevant formalities to be complied with and forwards the applications upon request. Furthermore, we do everything we can to improve connecting the cultural groups and student initiatives to the university, the students and to each other. The various groups can forward their contact information and website links to us so that we can post this information on our website or make contact with interested students. Our staff is available to provide more information during our office hours, either in person or by e-mail both during the semester and during the semester break. Welcome! We, the autonomous LGBTQ department, represent all homosexual, bisexual and transgender students at the University of Bonn before the student self-administration, the university directorate, the professors as well as the Bonn community. There are currently around 10 students active in the department. •We offer “Tell Mom” counseling, with help and advice for coming out, and we can provide information and mediate other problems. •We are highly engaged in eliminating discrimination against students of all nationalities at the University of Bonn. •We publish articles in ‘outcome!’, ‘BAStA’ and other mediums, with open discussion on relevant developments and events. •We host talks and podium discussions where academic experts give lectures and provide information on topics related to homosexuality. •We are the meeting point and social platform for gay and lesbian students at the university, so that they get to know each other and don’t simply co-exist. •We enrich the LGBTQ scene in Bonn with our many social events; we work together with local sponsors to throw a special party for the students every semester. Our operation is self-governing, meaning that the annual LGBTQ student plenary assembly determines the focus of our work. Our office (Room 11) is open from Tuesday to Thursday between 12:00 and 14:00 as well as from 15:00 to 17:00 as part of the coffee hour. The coffee hour is a casual gathering where you can relax, get to know us and your fellow students, and exchange information. During the coffee hour, you can also borrow books and magazines from our ‘Mediothek’ (a bookshelf full of novels, travel guides, advice guides, academic and historical books, DVDs and comics) or you can take a copy of the free monthly publications like ‘Rik’, ‘Exit’, etc. If you have any problems or questions, you can come and speak to a member of our trained counseling team on Fridays from 11:00 to 12:00 (“Tell Mom” counseling) or between 13:00 and 14:00 (trans* counseling). The conversations are of course anonymous and confidential. Students are also active outside of the university; therefore we strive to improve what the Bonn scene has to offer. We regularly work with the Round Table, the Oscar Romero House and the Bonn AIDS service. Twice a year, we host the legendary “Don’t Tell Mom” party, and take part in the Bonn LGBTQ Summerfest. We also complement our program with social activities such as BBQs, hiking day trips or movie nights. There is something offered every week. At the beginning of each semester, we offer a welcome round of Sekt as part of our freshman reception, before heading off to a cozy pub in the old town. The get-to-know-you brunch and the tour of the Köln scene are always a part of our frosh program. You can find the department’s current program for the semester in our magazine ‘outcome!’ and on our AStA website. Most of our events are announced via posters, and all are published in the BAStA. By subscribing to our E-M@il newsletter, you will receive up-to-date info before every event. Everyone is always welcome here! You ride your bike to class, you’ve seen the inside of a health food store and your dream house would not be located next a nuclear power plant and a GM cornfield? Then you might be interested in our work. We engage ourselves in current issues surrounding sustainability, both in terms of environmental protection and ecology, as well as in the social sphere. Our main topics are currently conscientious consumerism, fair trade, transport, energy and waste. Through all kinds of events, we raise awareness about the problems surrounding these issues, and this semester, we have published an eco-brochure outlining info, tips and important addresses and dates in Bonn. Some past projects addressed transportation, like the Bike Repair Picnic, or the popular Bike Market (in cooperation with ADFC) which takes place on the first Saturday of every month in the summer. We also strive to improve the bicycle infrastructure by calling for the revitalization of bike lanes and the installation of bike racks. Thanks to the initiatives of university’s environmental club “Grüne Hochschulgruppe”, we can now offer moving vans to the students. Since October 2012, the AStA has been cooperating with a car-sharing company and you can book an affordable moving van at www.studibus.de. For more information on the Studibus, please click here. We are always encouraging the university administration and the student union to keep making sustainable changes at the university. We push for the introduction of organic and fair trade products in the dining halls and cafeterias and organize paper recycling efforts at the university. As of the winter semester 2012/13, we offer a fruit and veggie delivery service for students in cooperation with Momo (a health food store). We try to promote our central themes through a variety of events. Last semester we hosted, among others, a “Fair Trade Breakfast” and an environmentally-friendly cooking evening where we prepared a three-course vegetarian menu with seasonal ingredients (in cooperation with the family education centre). The latter is also planned for this semester, as well as other informative events, movie nights and the like. The collection bins for empty toner and ink cartridges in the Nassestraße and Poppelsdorf dining halls are very handy. The proceeds from the collected cartridges benefit the student union’s day care centre. You can also give us your old batteries, CDs and corks – we’ll take care of the recycling or environmental disposal. We’re always open to new ideas, questions and projects. Come by our office in Room 6 of the AStA during our office hours, visit us on Facebook or write us an e-mail. We are always happy to see new faces and get an enthusiastic response. We are currently looking for new members to join our team, so if our work interests you, we look forward to hearing from you! Welcome to the University of Bonn AStA’s PR department! The PR department sees itself as a link between the AStA, the students and the press as well as between the AStA presidency and the departments. Whatever goes on in the AStA: you hear it from us – whether it be an important AStA date, event, or a press release about important issues within university politics. We are definitely more than just a press office! With publications and info desks at the University of Bonn’s institutes, we want to make people aware of the work that the student committees do and promote more involvement. First and foremost, a strong student council needs informed students who know what’s going on at their university and who are able to engage the student body. Of course, we’re always here to answer any questions or help solve any problems you may have. Write us an e-mail or visit us during our office hours! The PR department publishes the Friedrichs Wilhelm, which is the central publication of the AStA. You can find more information as well as all of the published editions on the Friedrichs Wilhelm’s webpage. If you want to work for the Friedrichs Wilhelm, you can contact us by e-mail! If you want to find a place where good education conditions prevail, you will be bitterly disappointed at the university of today, yet it is hard to find a better one. The Department of Civic Education does not want to spend its efforts on extending the monotone daily university life and improving its own portfolio. Our office takes on trainees and we want to produce compatible staffing modules all around. The ideal of education being as widespread as possible (which is still being proclaimed anyway) is now as empty as some student’s wallets. The AStA Department of Civic Education tries to instead create some highlights within the conformist university institution with its modest funds. We organize lectures, seminars and film screenings which are free to attend. For example, in the winter semester 2011/12, we held the event series “Terror”, with which we tried to develop a critical concept of contemporary political violence based on the contention between left wing, right wing and Islamic terrorism. In the following winter semester 2012/13 came the lecture series “Vom Mensch zum Ding” (From Person to Thing), where European refugee and integration politics underwent a fundamental criticism, and transcended the common criticism of deportation practices and individual case decisions of the migration regime. For the summer semester of 2013, we are organizing an event series on the critiques of anti-Semitism, of which we should not have to stress the necessity. Besides proper political education, we continuously deal with the critiques of political economy in daily seminars, which aim not only to grasp, but also to get rid of the irrationality of the global economic framework. We also publish free readers to broaden civic education. Our brochure “Der Verbindung Untertan - Zur Kritik der studentischen Korporationen” (The fraternity subservient – critiques of student corporations) introduces ideological commonalities (Types of male bonding, life-long bonds, ritual fraternities) of the pluralistic fraternity character, and therefore it is gone quickly, not only taken by critics of the corporations. Moreover, in the summer semester our reader on criticisms of radical Islam is published, which gained supporters in the last few years, not least in Bonn. Kilian Hoffmeister (LUST) and Matheus Hagedorny (not billed) look forward to further active interest in the work of the department. We gladly welcome anyone who wants to work for us, or simply comes by to read or to talk to us. If you notice sexism or other discrimination, if sexist publicity at the university catches your eye, if sexist theories pass as “academic” in your lectures, or if you have suggestions for events, write us an e-mail and we will address it. Whether you have been long engaged in issues gender equality, or have never before considered them; if you have questions, ideas, suggestions, recommendations, if you don’t have specific beliefs but only a vague interest; be you male, female, intersexual, transsexual, or you don’t want to identify with a biological or social gender, you are all welcome. The department for women and equality offers counseling for students – especially women – who feel disadvantaged due to unfair treatment in university life. The department wants to raise awareness for the various problems relating to gender, gender identity, background or lifestyle that go along with university life. Despite the legal status that proclaims equality, actual equal treatment of students at the University of Bonn has not been reached by a long shot. We offer counseling for students by students, in order to safeguard the goal of equality of men and women for the long term. It is still necessary to fight to achieve social acceptance of gender topics, so that equality can have an impact on the quality of research. Talent is drawn from a great pool in order for the diversity of research perspectives to be supported. Through our work, we want to improve the social quality of our university and relieve students of all problems related to societal structures so that they can concentrate on their studies. We also want to encourage society to rethink the subtle and sometimes very apparent problems surrounding equality and gender ratios. In case you want to write an essay on a female/political issue, for example, and the professor refuses to allow this for no apparent reason, we can help you out. Outside of our counseling hours, you are all are invited to contact us by e-mail, phone or in person. We can also provide you with literature, books and other information materials. We will gladly put you in contact with the right person for your concerns. The percentage of women amongst the student body has greatly increased over the past few years. Nevertheless, in some faculties at the university, women are still greatly underrepresented. The introduction of the bachelor/master system has exacerbated this problem, because less and less women have decided to take up masters studies. The higher the university graduation rates become, the lower the percentage of women. Unfortunately, this phenomenon is not only restricted to students. At the University of Bonn, the percentage of female professors lies around 11%; the national average of all post-secondary institutions amounts to 15% (in 2008/2009). Dates, event updates and office hours can always be found on this page. Our numerous events aim to shift questions on themes such as legal vs. actual equality of women, feminism, and gender ratios to the foreground. We are in cooperation with the ‘Forum for Women and Gender Research of the University of Bonn’ and the ‘Women’s History Consortium’ – respectively the Bonn Women’s Museum, the Rosa-Luxemburg Foundation NRW, the queer-feminist group ‘riot skirts’ from Bonn, and many other groups who are involved in this field. Our department has at its disposal a small but quality collection of writing on the themes of women, feminism and gender ratios. Over the next little while, the library is being incorporated into the digital catalogue of the university and state library, and will then be accessible through the BoKI system on the ULB website. Of course you can always come by any time to browse. You can come to the social welfare department for help with any problems relating to everyday student life. Since the beginning of 2012, new regulations are in place regarding the child allowance. Before, you could only earn up to a maximum of 8004€ for your parents to still receive a child allowance for you. This limit has been abolished as of January 1st, 2012. However, if you have submitted applications before January 1st, 2012, the limit is still in place for the period beyond the changeover date. Otherwise, as long as you have not completed a vocational qualification, you can earn as much as you want. If you have already completed a vocational qualification (teaching qualification, bachelor, etc. ), then there are some conditions which you have to adhere to so that your parents can continue to be able to claim child benefits. You can find details here and here. Please note that the 20 permitted weekly work hours are evaluated differently than the BAföG regulations. With BAföG, you can also work more than the 20 hours outside of school time (semester breaks, weekends, evenings). With child allowance, you cannot. We also have many more brochures and readers on subjects like housing subsidies, studying with children, renting rights etc., as well as books that you can borrow for free. The social services department is available to authenticate your documents for free between 12:00 – 13:00. Your documents must relate to your studies in a general sense*. Due to the high demand, we ask that you not bring us more than 10 documents at a time. We do not authenticate any official government documents such as birth or marriage certificates. A personal ID can be authenticated. Tip: From 11 to 12 o’clock, the AStA admin office is also available for document authentication. Only when we have all the documents, we can process your application. The approval can take up to several weeks. There is no guarantee that you application will be accepted once your application is complete. You have to be able to pay back the loan after 3 months. Private offers are sent to and posted in the AStA . The offers can also be viewed online. Student residences are administered by the Studierendenwerk. Apllication is only possible via online registration. If all of the above ways to find a place didn’t work out, the following might work as an interim solution. More offers can be found on the university’s web page. What does the AStA athletics department actually do? The varsity sports of the University of Bonn are organized by the student-run AStA athletics department and the central organization for varsity sports (zentrale Betriebseinheit Hochschulsport). The sports operation is one of the largest in the Bonn area, with a target audience of over 26 000 and offering more than 400 sports classes. The sports on offer are listed in the varsity sports flyer that is published at the beginning of every semester: from autogenic training to martial arts to Zumba Fitness. We also offer sports such as indoor cycling, inline skating, Pilates, salsa, Bodywork and Fatburner. The climbing facilities are being expanded and will offer a larger variety of climbing walls. Interested students can obtain their pleasure craft license, sailing license or diving certification from us. Students can participate in most team sports such as beach volleyball, soccer or basketball as a hobby in an enjoyable environment or they can take part in our surf and catamaran camp at the IJsselmeer in the summer semester. All trainers are highly qualified and have furthered their knowledge through many years of experience and continued education. We print 3000 copies of our varsity sports flyer and it is available in all the central university facilities. The department advisors work to ensure the entire sports operation is well implemented not only within the university but also beyond the doors of the AStA and the school. To achieve this, they contribute financially to Bonn students who are eager to take part in competitions and tournaments, and also are responsible for the meaningful and economical utilization of the approx. 40 000€ yearly social contribution from the students. The athletics department strives to offer new and interesting sports classes which are as affordable as possible and in some cases even free of charge. The athletics department represents your interests as a sports participant before the student body organizations at the University of Bonn as well as before the institutions that are in cooperation with the AStA. Every sport has the possibility to actively participate in the representatives’ assembly. If you want to teach a course, have a proposal or simply need advice on sports-related matters, the athletics department will gladly help you out. Diese Seite wurde zuletzt am 24. April 2019 um 13:23 Uhr geändert.